Average insurance rates for a 2002 Toyota Camry are $962 a year for full coverage insurance. Comprehensive insurance costs an estimated $146, collision costs $198, and liability costs around $460. Buying a liability-only policy costs as low as $510 a year, with high-risk insurance costing $2,070 or more. Teenage drivers receive the highest rates at $3,920 a year or more. Rate data is compiled from all 50 U.S. states and averaged for all 2002 Toyota Camry models. Rates are based on a 40-year-old male driver, $500 comprehensive and collision deductibles, and a clean driving record. Remaining premium consists of UM/UIM coverage, Medical/PIP, and policy fees. For a middle-aged driver, prices range go from as low as $510 for just liability coverage to a much higher rate of $2,070 for a high risk driver. These differences illustrate why anyone shopping for car insurance should compare prices for a targeted area and risk profile, instead of making a decision based on average rates. Shopping for the most affordable auto insurance over the internet is impossible for beginners to shopping for insurance online. With dozens of choices, how can you effectively compare them all to find the best price? Finding the best rates is not rocket science. Basically, everyone who buys insurance stands a good chance to be able to find better rates. Although car owners do need to understand the way companies market on the web and use this information to your advantage. Companies offering auto insurance don’t always advertise all available discounts very clearly, so we researched both well-publicized and the more hidden insurance coverage savings. Passive Restraints and Air Bags – Vehicles equipped with air bags or automatic seat belts can receive discounts of up to 25% or more. Early Signing – A few companies offer discounts for switching policies before your current policy expires. This can save 10% or more. Driver’s Ed – Cut your cost by having your teen driver complete a driver education course in high school. Discount for New Cars – Adding a new car to your policy can be considerably cheaper due to better safety requirements for new cars. No Accidents – Drivers who don’t have accidents can earn big discounts when compared with accident-prone drivers. Federal Employees – Active or retired federal employment may qualify you for a discount on Camry coverage depending on your company. It’s important to understand that most credits do not apply to the entire policy premium. Some only reduce the price of certain insurance coverages like comp or med pay. Just because you may think it’s possible to get free car insurance, you won’t be that lucky. To see a list of providers offering insurance coverage discounts, click this link. When should I use an insurance agent? When buying coverage for your personal vehicles, there really is not a best way to insure your cars. Each situation is unique. For example, these questions might help in determining whether you might need professional guidance. What happens if I owe more than my 2002 Toyota Camry is worth? Can I afford to buy a different vehicle if my 2002 Toyota Camry is totaled? Can I drive in Mexico and have coverage? Do I pay less for low miles? If you can’t answer these questions but a few of them apply, you may need to chat with a licensed agent. If you don’t have a local agent, simply complete this short form. 21st Century, Allstate and State Farm regularly use ads on television and other media. All the companies have a common claim that you’ll save big if you move to their company. How do they all claim to save you money? This is how they do it. Insurance companies are able to cherry pick for the type of driver that is profitable for them. For instance, a driver they prefer might be profiled as between the ages of 30 and 50, a clean driving record, and drives newer vehicles. A customer getting a price quote who matches those parameters receives the best rates and most likely will save quite a bit of money when switching. Drivers who don’t qualify for these standards will have to pay a higher premium which usually ends up with the driver buying from a lower-cost company. The ad wording is “people who switch” not “everybody who quotes” save money. That’s the way companies can truthfully advertise the way they do. Because of the profiling, you should compare as many rates as you can. Because you never know which company will fit your personal profile best. Understanding the coverages of insurance can be of help when determining which coverages you need and the correct deductibles and limits. Insurance terms can be impossible to understand and coverage can change by endorsement. This pays for damage caused by mother nature, theft, vandalism and other events. You first must pay your deductible then your comprehensive coverage will pay. Comprehensive insurance covers things such as theft, damage from getting keyed, fire damage and hitting a deer. The maximum amount you’ll receive from a claim is the actual cash value, so if your deductible is as high as the vehicle’s value consider removing comprehensive coverage. Uninsured or Underinsured Motorist coverage protects you and your vehicle’s occupants when the “other guys” are uninsured or don’t have enough coverage. It can pay for injuries to you and your family and damage to your Toyota Camry. Because many people only carry the minimum required liability limits, their limits can quickly be used up. That’s why carrying high Uninsured/Underinsured Motorist coverage is important protection for you and your family. This pays for damage to your Camry from colliding with another car or object. You have to pay a deductible and then insurance will cover the remainder. Collision insurance covers claims like colliding with a tree, crashing into a ditch, hitting a parking meter, sustaining damage from a pot hole and hitting a mailbox. Paying for collision coverage can be pricey, so you might think about dropping it from vehicles that are 8 years or older. 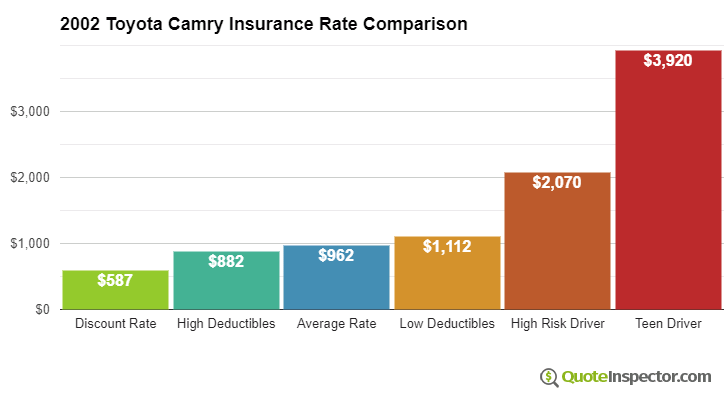 You can also raise the deductible to get cheaper collision coverage. Liability coverage can cover damage or injury you incur to other’s property or people that is your fault. It protects YOU against claims from other people, and doesn’t cover your own vehicle damage or injuries. Coverage consists of three different limits, bodily injury for each person injured, bodily injury for the entire accident and a property damage limit. You might see policy limits of 50/100/50 which stand for $50,000 in coverage for each person’s injuries, a per accident bodily injury limit of $100,000, and a limit of $50,000 paid for damaged property. Liability insurance covers claims like structural damage, bail bonds, emergency aid, funeral expenses and court costs. How much liability coverage do you need? That is a personal decision, but buy as high a limit as you can afford. Discount 2002 Toyota Camry insurance can be found on the web and with local insurance agents, and you need to comparison shop both in order to have the best price selection to choose from. Some insurance providers do not offer the ability to get a quote online and usually these regional insurance providers provide coverage only through local independent agents. When you buy insurance online, it’s not a good idea to buy lower coverage limits just to save a few bucks. There are a lot of situations where an insured dropped collision coverage and found out when filing a claim that their decision to reduce coverage ended up costing them more. Your focus should be to find the BEST coverage at a price you can afford. Insureds switch companies for a number of reasons such as poor customer service, delays in paying claims, extreme rates for teen drivers and not issuing a premium refund. Whatever your reason, finding a new company can be pretty painless.